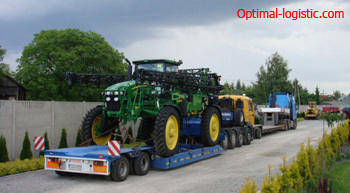 One of the main services of Optimal Logistic is the transportation of a sprayer. This oversized and heavy equipment requires special types of transportation. Our campaign has all the necessary equipment for these purposes. For transportation, machines specializing in the delivery of such types of agricultural machines are used.Optimal Logistic manufactures transportation of sprayers of different equipment in Ukraine, Europe and Central Asia. And also taking into account all sorts of difficulties and features of technology, ensuring the arrival in the specified period and complete safety of the equipment. Special machines are ready to bring cargo to any region that the company covers. In Ukraine, we produce the shortest delivery in comparison with other companies. The cost is affordable and includes the necessary operations, does not change at the end of the delivery of the goods. Our employees are qualified specialists who can deliver high-quality and oversized equipment and sprayers, including.Our managers calculate the price according to generally accepted standards and always try to meet the wishes of our customers. By contacting Optimal Logistic, you will be able to find out all the information you need, including the cost of transporting the sprayer and its geography.